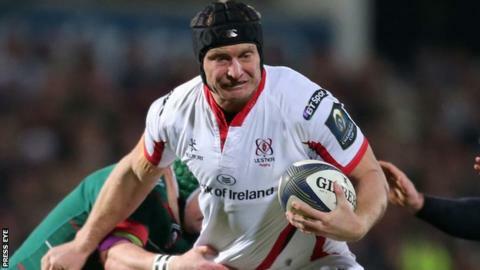 Cardiff Blues have signed 33-year-old South African lock Franco van der Merwe from Ulster for the 2017-18 season. Once-capped van der Merwe has spent three seasons with Ulster, making 68 appearances to date. "We need to add depth in leadership and in that position," said Blues coach Danny Wilson. Van der Merwe played Super Rugby with South African sides the Lions and Sharks before joining Ulster. He was capped against New Zealand in 2013. "He has been a fantastic player for Ulster, he knows this competition (Pro12) and he's played at the top end of the game in terms of achievements in this competition," said Wilson. "He's a big leadership figure which in our front five is what we need. "(He's) an on-field presence, but also an off-field and training ground presence for our younger pros." Cardiff Blues currently have former New Zealand international Jarrad Hoeata, South African George Earle and James Down as senior specialist locks. Macauley Cook and Josh Turnbull have been used at both lock and flanker, while academy pair Seb Davies and Shane Lewis-Hughes have made senior appearances. Van der Merwe told Blues' website: "When I was approached earlier this season I spoke to (former Ulster number eight) Nick Williams and George Earle, who I played with for the Lions, and they had so many good things to say about the club. "They were really positive about what's happening and going to happen and made it an easy decision for me. "Whenever I have played them it's been a tough game, especially at Cardiff Arms Park where I have been on the wrong end of the result a couple of times."